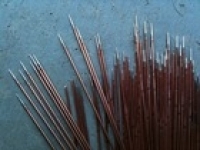 North StarPikes and Lancers 100mm Approx 40 per pkThese wire spears are the same thickness as the 100mm spears, so are suitable for 28mm figures. The ends are shaped to a point rather than a spearhead which makes them better for cavalry lances. They are also more suitable for representing Renaissance period Pikes than the spearhead shaped wire. They can be used for flagpoles. Approximately 40 a pack.